These high quality earth friendly strap clips are an excellent choice to help you create ecologically friendly ID badges and name tags. Each strap clip is made from fully-recyclable PVC-DOP which is a material that is designed to prevent contamination to our environment. These strap clips are an excellent choice for use in conjunction with the eco-friendly ID cards and badge holders that we carry. They fit in the pouches and snap perfectly. Outstanding customer service and clips were received within 3 days. Prices cannot be beat. MyBinding is our "go to" company. Very durable badge clips Review by Carol G.
Received the product as described and they are sturdy and durable. They are great for laminated employee badges and excellent quality. A great price and were helping the environment1 Very satisfied with purchase and fast shipping. Just as ordered Review by BRENDA J. Welcome to MyBinding Video. 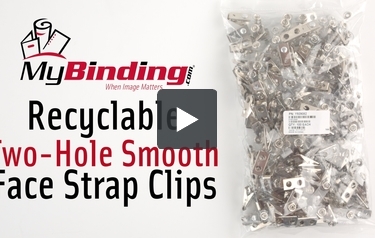 These are the Recyclable Two-Hole Smooth Face Strap Clips from MyBinding. The smooth face two hole clips are made of nickel-plated steel, and the straps are made from fully recyclable PVC-DOP. These strap clips are an excellent choice for use in conjunction with the eco-friendly ID cards and badge holders that we carry. They’re available in bags of 100. For more videos and all your binding needs, visit MyBinding.com.